1. 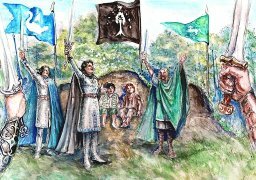 The Ring-bearers are honoured on the Field of Cormallen. “When Sam awoke, he found that he was lying on some soft bed… …All the air was full of a sweet mingled scent. 2. The Ring-bearers revisit fair Ithilien.